It will be hot this weekend in the Azam Rwanda Premier League when Police FC host APR FC both teams eying for the second place while SC Kiyovu, Marines FC and Gicumbi play aiming to secure themselves from the relegation zone. With both teams remaining with six games to finish their 30 matches of the league, Police FC who are in the 3rd place with 47 points, will this Sunday at Kicukiro stadium be struggling for a win to have equal points with APR FC, who are 2nd with 50 pints. 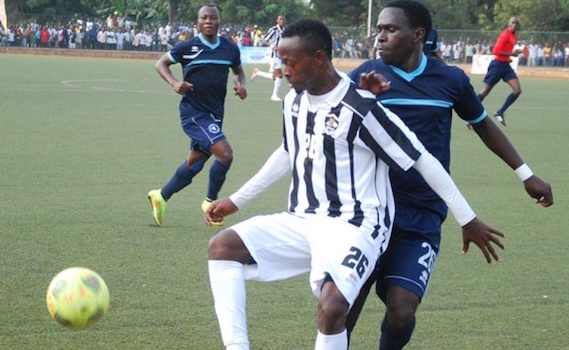 Police FC has not been able to get a win over the army side in Azam Rwanda Premier League in the last five years now, despite having won in the Peace Cup in 2015. Police FC eliminated APR FC in the semi-finals of the Peace Cup and procceeded to beat Rayon Sports FC on the final with a 1-0 win. Placed in the first place, with five points more than 2nd placed APR and remaining with two more games, Rayon Sports will travel to the Northern Province for a clash with Musanze FC this Saturday April 29, 2017. The Blues and White team will be seeking a win to raise their hopes to win the league title without their head coach Juma Masood, who has been banned by management over indiscipline. Rayon Sports will be coached by the vice Maurice Nshimiyimana “Maso’’ who was the deputy coach of Musanze FC last year. It won’t be an easy task for Nshimiyimana who will be seeking three points against Sosthene Habimana and vice coach Hamad Ndikumana Katauti who respectively played for Rayon Sports. Sosthene Habimana who was in Rayon Sports FC as a coach in the recent years will be looking for a win with his team captain Peter Otema who left Rayon Sports to play for Musanze FC while striker Andre Lomami will be playing for Rayon Sports having left Musanze FC last year. Musanze FC are the sixth in the league with 38 points. Placed in the 11th place, Mukura Victory Sports will host Bugesera FC, who will be being led for the first time in the league by Gilbert Kanyankore Yaounde as a coach. Having replaced Vincent Mashami who was appointed as the deputy coach in the national football team, Kanyankore will be eying for a win for Bugesera who are in the 5th place with 39 points. Gilbert Kanyankore, who was once a coach in Les Citadins, SC Kiyovu, Rayon Sports FC and in the national team will play Mukura Victory Sports coached by Ivan Minnaert at Stade Huye this Saturday. Placed in the last place 16th in the league with only 12 points, there is little chance for Pepiniere FC to remain in the first division this year. The Ruyenzi based side will visit AS Kigali at Stade de Kigali in Nyamirambo today. The City of Kigali sponsored side who are placed 4th with 44 points will host Pepiniere looking for a win to narrow the gap between them and Police FC, who are placed ahead of them with a three-point difference. Gicumbi FC, who are in the 15th place with 18 points will host Amagaju FC in a must-win game battling to take themselves from the relegation zone. They have a remaining game againt Rayon Sports, who played against Nigeria’s Rivers United last weekend. A win over Amagaju FC, who are in the 12th place having 26 points would help Gicumbi FC to close the gap between them and Marines FC and Kiyovu who have 20 and 22 points respectively ahead of Gicumbi. Marines FC will travel to Kirehe, on Sunday seeking for a win against the newly promoted Kirehe FC coached by Hamiss “Kishi’’ Sogonya who expressed his full hope to stay in the top flight after having triumphed over AS Kigali by a 1-0 win last Sunday in Kirehe. Kirehe FC are in the 9th place with 28 points. Aloys Kanamugire’s SC Kiyovu will be in Nyagatare this Saturday to play against Sunrise FC who are on the 10th position. And on Sunday, Ettincelles FC on the 8th position with 30 points will travel to Rusizi for a tie with Espoir FC 7th with 33 points.